Creating Facebook Photo posts has never been easier! This article will provide you with step by step instructions to create your first Facebook Photo post. 1. Now that your Bid has been approved (or once you receive a Direct Offer) it's time to create your content! 4. A pop up will appear where you can crop your image as desired. You can choose from two different cropping tools: Square or Custom. Once you have cropped your image, hit Save. 5. Now that you have uploaded your image, you will need to create the description for your image in the box provided. Along with your custom content, your Description must include all of the additional required elements as set by the Marketer. 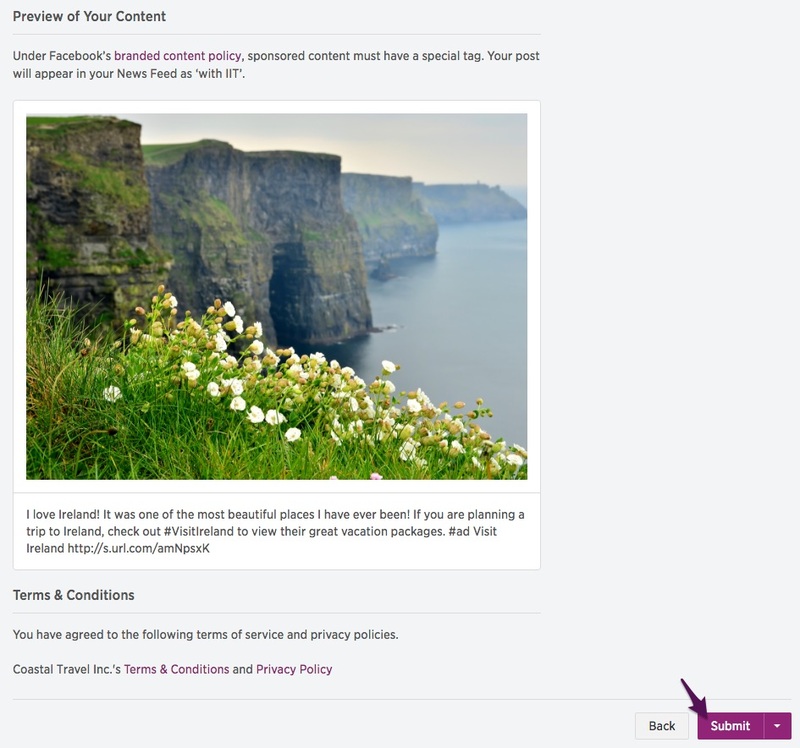 The required elements can simply be dragged and dropped into your content by clicking on the arrows on the far right-hand side. 6. Once you start to type your content into the editor you will noticed disclosure options below. The platform will automatically check your content for FTC compliance. You can simply select one of the options provided. 7. If you choose to add in your own disclosure, as long as it is FTC compliant, you will notice a green notification that verifies your content contains the correct disclosure. 8. Once you have finished adding all of the required elements to your content you will be able to preview your content before you submit it to the Marketer for approval. If you are satisfied with your content and its appearance, hit Submit. *Remember do not post this on your Facebook Page! Once it has been approved by the Marketer the system will automatically post your content for you.